Bonikowsky, Laura Neilson. "Arrival of the War Brides and their Children in Canada". The Canadian Encyclopedia, 25 January 2019, Historica Canada. https://www.thecanadianencyclopedia.ca/en/article/war-brides-they-came-for-love-feature. Accessed 25 April 2019. Mrs. Jones, of Littletown, Canada, thought her heart would stop when she answered the door and saw the telegram delivery boy. It was 1943 and Mrs. Jones's son, Robert, was stationed overseas somewhere. She took the yellow envelope with a shaking hand. Fearing the worst, she blinked back tears and read: "Getting married. Need 60 pounds. Letter follows. Mrs. Jones sank into a heap on the floor. Bob Jones was one of nearly 48,000 Canadian servicemen who married overseas during World War II. 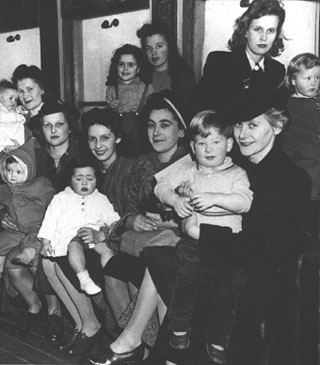 Between 1942 and 1947, the government brought 47 783 "war brides and their 21 950 children to Canada. Relatively few came before the war's end. They began arriving in earnest when the RMS Mauretania, carrying 943 women and children, docked at Pier 21 in Halifax on February 10, 1946. Liz Smith, like her war bride sisters, came to Canada for love. The heightened emotions of war, fostered by anxiety and nurtured by fear, made romance especially poignant. Young soldiers, airmen and sailors, many away from home for the first time, were lonely and homesick. The exuberance of youth was not completely dampened by the exigencies of war. It was only natural that the men would find companionship with the war-weary young women who were deprived of basic necessities, whose boyfriends were far away and who hadn't had much fun in a very long time. Most couples met at dance halls and pubs - it was difficult for any woman to conduct her daily business without encountering the foreign servicemen. Bob met Liz on a blind date at one of the dances organized to bolster morale. Mutual attraction grew quickly into love. Knowing their time together would be brief, they, like many couples, married on short acquaintance. The first marriage of a Canadian serviceman to an Englishwoman occurred only 43 days after the first Canadians arrived in England in November 1939. War brides and their children arriving in Halifax from overseas. The government of Canada issued each of them a cookbook, but after that they were on their own (Public Archives of NS). The war brides travelled to Canada without their husbands, who had already been repatriated or were still on overseas duty. Most of the war brides - 44 886 - were from England. The rest came from Holland and other European countries, Africa, Russia, India, Australia, and the Caribbean. Transporting the dependents was the responsibility of the Department of National Defence; the Immigration Branch of the Canadian Department of Energy, Mines and Resources; and the Canadian Red Cross. The war brides were taken care of from beginning to end of their voyage. The Canadian Wives Bureau arranged the women's passage, delivered them to their ships and distributed information. Red Cross volunteers tended to their needs in the hostels where they stayed awaiting departure. Once aboard ship, the women and children were under the care of the Army Conducting Staffs, consisting of the Royal Canadian Army Service Corps, doctors, nurses and Voluntary Aid Detachments, of which the Red Cross was an important component. Red Cross Escorts made the crossing many times accompanying the women. The escorts and the abundance of food not seen during the war made the two-week crossing a luxury cruise for many of the war brides. For others, the nausea of seasickness or pregnancy made the journey torturous. The crying of seasick children grated on the nerves. The first trip made it obvious that troop ships were unsatisfactory transport for seasick women and children. Bathroom facilities were inadequate and the ship reeked of vomit and dirty diapers. Once the ships' facilities were adjusted, the voyages were more pleasant. Upon arrival in Canada, women travelling beyond Nova Scotia continued by train, still escorted by the Red Cross. It was nerve-wracking, coming to a new country to join husbands whom they barely knew and whose families they had never met. Many feared their arrival would not be well-received. The country turned out in force to welcome the new citizens. In towns and cities across Canada, volunteers met the trains and delivered each bride to her husband's safekeeping or ensured her safe accommodation if he could not meet the train. 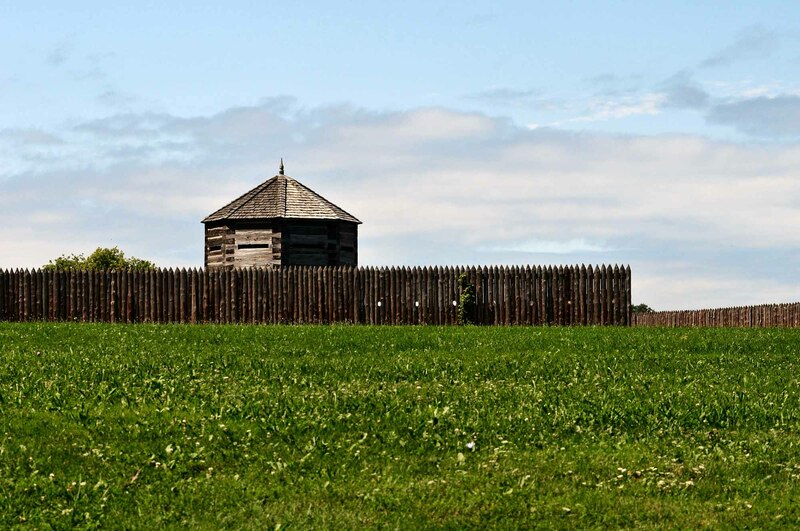 Canada was a culture shock for many, especially big-city girls who suddenly found themselves in rustic farmhouses without running water or indoor plumbing. For some, the dashing soldiers they had met in Europe were broken by war, strangers to their families and new wives. The post-war housing shortage left many brides living with their husbands' families, outsiders in an unfamiliar environment. Most, like Liz, found a warm welcome among the families of the men for whom they had left home and kin. As Liz and Bob made a home for their family, she, like most war brides, adjusted and persevered, growing to love her adopted homeland.